New Chef at Borrowed Time! We miss you all so much and hope you've had a cozy winter. We've still got a lot of work to do to get our new space ready for summer but we're inching closer every day. Many of you have asked about our progress and offered to help we appreciate every encouraging word and offer. We're still on target for an early May opening and will keep you posted. Today's news is really exciting to share. As you probably know, Robert & I opened Borrowed Time because we're passionate about serving delicious food & drink while treating guests like friends & family. Our expertise leans heavily on the beverage and service side, and while we're proud of the small plates menu we've served to date, we're ready to step up our game in the BOH (restaurant speak for back of house, or kitchen, in case you're wondering). It is with great pleasure that we announce the addition of our very talented friend, Eoen Clark, to the Borrowed Time family as Head Chef. We've always been impressed by Eoen's passion and ability in the kitchen and couldn't have hoped for a better partner to take over all things culinary. 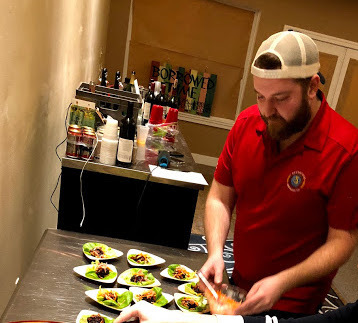 Eoen comes to us from our friends at Saugatuck Brewing Company, where he's crafted many creative and delicious dishes over the past few years. "My cooking style is elevated comfort food. I'm inspired by humble beginnings of food, whether it be street food or grandma's recipe, and trying to reimagine it with a modern approach," Eoen said. "Guests can expect to see dishes that sound familiar and hopefully invoke a memory but have a unique twist whether it be in flavor profile or preparation. I love to focus on unique proteins and would love to highlight fresh produce readily available in our area." With the addition of Eoen, it's our hope to feature a more unique and diverse menu - we will keep our staples, but allow Chef to take complete creative control of its expansion and special, seasonal offerings. This will also give us more time to focus on the FOH (yup - front of house) and scale our service style to grow into our new space. We hope you'll all help welcome Eoen into the Borrowed Time family and can't wait to share the deliciousness he brings to the menu this May! Progress Report & Help Build Our Team!